America, as a nation, is not sustainable. Our current rate of consumption exceeds available resources, and our current economic structure benefits a small minority. There is an increasing, staggering, divide between wealthy and poor and the stress caused by dwindling resources and inequality will continue to lead to civil unrest. Proposed “solutions” are partisan, further stressing our system, and will not result in the economic and social rebirth we need as a nation. The burden on our system, political, economic, and social, is too great, and the numbers don’t add up. Together we must come up with solutions benefitting all to bridge the divide and stimulate growth to fill the dividing gaps, income and educational. Otherwise, I fear, our future as a nation is in jeopardy. If you look at other countries that have fallen, our trends are consistent. I want to introduce and encourage a non-political discourse focusing on non-partisan solutions that can be implemented locally, driven by individuals, benefitting our communities nationally. I am writing this as a concerned citizen looking for solutions to make us viable as a nation and I am committed to doing all I can to make these solutions a reality. As individuals, we can decide to work together to find and implement feasible solutions that will save our communities, or we can continue to be divided and our nation fail. That is the choice we must all make. This article is about the survival of our nation. We are at a tipping point, the time to act is now. I have worked with state agencies for the past ten years building facilities around Georgia and have spent a considerable amount of time staying in and driving through small towns across Georgia. What I like most about the position is being able to explore parts of my state I may not have seen otherwise, meeting people and experiencing a little bit of what life is like outside of the city (Atlanta, where I live). Georgia is filled with many beautiful places, charming towns, and friendly people. For some towns, times are good, for most, things could be better. Many of these communities were once thriving industrial towns, but that time has passed. These small southern towns (most located along the railroad that ran to Atlanta) are shells of what they once were industrially and many commercially as well, economies stagnant or on the decline. Well paying jobs are few and far between and people in these communities are left wondering what can be done to revive their town and create jobs. It is a question that has plagued me as well. I feel for these communities and the individuals trying to revive local prosperity. I want these towns to realize their full potential and create economies that allow people to make a decent living now and into the future. As I speak to locals, many are frustrated, hoping answers will come from a national level, praying that someone will introduce something that will truly make a difference to their town. I have seen firsthand the affects of a global economy and consumer culture on our small towns. People want to be heard and want help making their towns thrive as they once did. I understand the sentiment of discontent with the current system, our current economic model and projected path forward does not offer much opportunity for most of these small towns or the people living there. Although distinct, I see the struggles in our cities as well. Jobs are being replaced with automation, deleting entry and middle-level positions, leaving an entire population trying to live on jobs paying less than Living Wage. These issues are real and will only intensify if we don’t shift our approach as a culture. As someone who believes the United States to be a land of opportunity, I find the current state of our country unacceptable. I care too much about Atlanta and every other community I visit to let us fail, and I know others feel the same way. Regardless of differences, I believe most Americans want The United States of America to collectively (as a nation made up of diverse individuals) succeed and be our finest; a perpetually prosperous nation filled with thriving communities, for all. We should settle for nothing less. Over the past year, I have worked to form an understanding of our current economic structure (benefits and pitfalls) to pinpoint where and why we are failing many and to establish the realistic options available to rectify our current state. By looking for overlapping patterns, practices, and methodologies, social and economic, across all demographics and regions, my goal is to identify a universal approach leading to communities able to sustain themselves and thrive. The pursuit of achievable and implementable solutions for sustained prosperity of our nation is the genesis of my thoughts expressed below as well as a catalyst for my personal pursuit of positive change. I encourage everyone to look beyond political discourse at the root of issues in our communities, at how we function as a culture, our consumption rates and practices, and our production capabilities and capacities, in our cities and small towns. Only through understanding and rectifying concerns locally can we achieve our full potential as a nation. 1) Available resources aren’t being optimized. 2) Current methodologies and consumption create a net loss on the total system and are not sustainable. 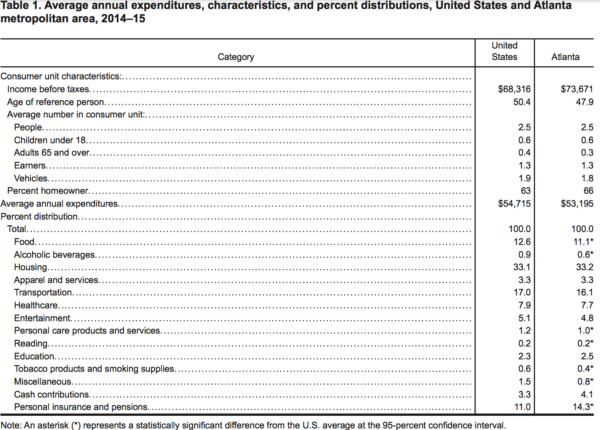 3) We are a consumer economy. 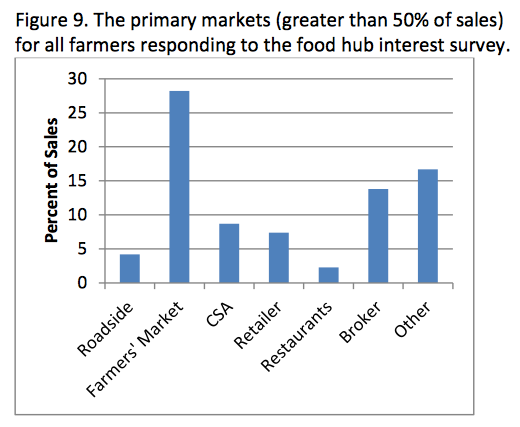 4) Only a small percentage of consumables are locally sourced. 5) We create too much waste. 6) Our energy model economically benefits a minuscule percentage of the population. 7) Rich are staying rich and getting richer, and the have-nots are getting poorer. 8) People want change but many don’t want to change or don’t know how to change. 9) People want jobs to return but don’t propose paths forward that will create jobs. 10) People are great at pointing out problems, but few are offering solutions. 1) Individual communities must prosper to have a prosperous nation. 2) Communities that can support themselves prosper. 3) A nation of sustainable communities constitutes a sustainable and prosperous nation. 4) Lasting change originates locally. 5) Local change is initiated by individuals. Solutions implemented locally will create change nationally. If each region achieves sustained economic stability, we will by default have a prosperous nation. Of all the models I have thought through (there have been many), regional solutions for consumables is the only path forward I have found to be applicable and implementable in every community, large to small. Regionalism, as I propose, is non-partisan, maintains our current capitalist global economic structure while stimulating local growth and promoting nationalism, creates jobs, and stimulates economic growth and development, all driven by local consumption fueled by diverting money already being spent and executing solutions already available. Regionalism: Working locally to identify and utilize resources and deficiencies to implement methodologies and solutions to achieve sustainable regions. Nationalism: Working as a nation made up of regions to identify and utilize collective resources and deficiencies to implement methodologies and solutions to achieve a sustainable country. Globalism: Working as a country to determine and use our resources and shortcomings to apply methods and solutions to maintain a sustainable global economy. By focusing on regional assets to maximize local production, we can level the world market. Regions become brands with specialized products making them more attractive, and local production becomes something to be proud of, leading to “nationalism”. A confident nation made up of sustainable regions less reliant on imports is well positioned globally, that is nationalism within the global market. To me, regionalism is nationalism, and nationalism is achievable without shutting ourselves off globally. Regions can be as small as a neighborhood or as large as the Southeastern United States. From micro to macro the concept is consistent and applicable, areas adapting methodologies to best sustain themselves autonomously while contributing to the prosperity and sustainability of the economic structure as a whole. 3) Buy and build locally utilizing identified resources and trade with surrounding regions to make up for deficiencies. Shifting to a regional mindset for consumption will allow local expenditures to be a catalyst for economic development with consumers directly impacting local markets, creating jobs and opportunity. Consumables, from energy to agriculture, become a catalyst for growth rather than a hindrance. America is a consumer nation underutilizing our power as consumers. We are capable of stimulating regional advancement by modifying how we spend our money. 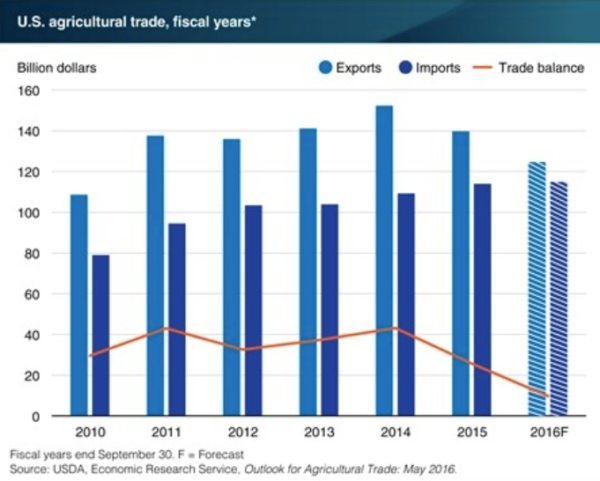 The graph above is taken from the USDA article “US agricultural exports down, imports up in 2016” and shows imports vs. exports as well as the trade balance (difference between a countries imports and exports in a given time period). 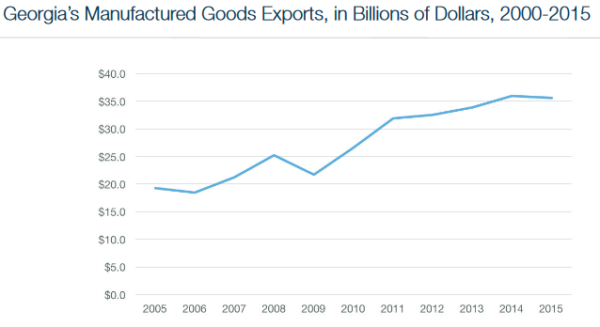 Exports are on a two year decline after reaching a growth peak in 2014. Imports have maintained a consistent level past two years after steady increase over last five years. Our trade balance is decreasing. With an increase in imports and a decrease of exports, we now import nearly as much as we export. The United States use to operate at a net positive of $30-$40B. Overall: We are growing more reliant on globally sourced food (imports) as national food consumption escalates and our exports decline. “Feed The World” – Whereas locally grown agriculture was once for local consumption, we now primarily sell local agriculture on the global market while we consume cuisine sourced globally. Even the most fertile regions nationally aren’t being utilized to adequately feed local populations. Monocultural Farming: Growing the same crop in the same soil without rotation. Corn, wheat, soybeans, cotton, and hay account for 90% of harvested acreage in the United States. Efficiencies such as stationary irrigation and lean practices allow for a higher yield and larger profit margins. Soil nutrient depletion and crops more prone to infestation lead to the high use of pesticides and synthetic fertilizers. Produce has depleted nutritional value. Yield viewed as a commodity to the highest global bidder, not locally, meaning local food is coming from elsewhere. Currently, California provides most of the nation’s produce grown domestically. A high percentage of resources are going to make biofuel and feed. Over 75% of the corn cultivated in the United States is not for human consumption. Vast amounts of energy required. Machines do most of the labor (meaning fewer people are employed) and expend large amounts of fuel. Transportation needed to ship globally contributing to air pollution and energy consumption. Industrial Meat Production: Single animal, high yield, meat production. Waste: Close quarters and high numbers of animals confined to indoor and outdoor containment facilities produce more waste than can be absorbed into the soil. Waste is stored in open pools and used as raw fertilizer for crops. Negative effects include air and water pollution, increased food contamination, and decreases the land value. Additives: Hormones are used to increase yield; antibiotics are used to keep animals healthy in the conditions. These are passed on at consumption, linked to health issues and antibiotic resistance. Currently, 99% of the meat we consume comes from factory farms. Sustainable Local Agriculture: Growing and consuming food regionally in a way that allows for continued fertility of the region and maximum utilization of all available resources. “Traditional Farming” – Using sustainable methods to feed local population. Natural farming practices focused on maintaining soil integrity and nutrients. Crop Rotation – Planting multiple crops in the same soil in a rotating basis. Increased need for manual labor. If done correctly, minimal aside from the potential for a smaller yield, but the model would be driven by local demand and production would increase in direct response to local demand. Ideally, all farming will shift from a monocultural model to sustainable practices, but that isn’t realistic at this moment. Focus regionally to source food locally while working with industrial farms to come up with solutions that allow for profitability on the global market while maintaining the integrity of their region. Identify local resources and demand for agriculture capable of growing in the region. Reduce industrial meat consumption from 99% to 75%. Locally sourced food with higher nutrient content and better flavor grown using fewer fertilizers, pesticides, fuel, and packaging, creating less waste. 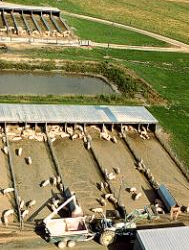 Jobs created by regional demand and through implementing strategies to remediate current issues resulting from monocultural and industrial farming techniques. Regional agriculture resources and consumption become an impetus for local economic growth. Farmers can choose between two paths to market, global and local, optimizing regional agricultural revenue and output while benefitting the community. Furthermore, focusing regionally on food solutions should help us get beyond some of the social issues we face as a nation. There is something prideful about eating locally grown and raised meat and produce, it is nationalism at it’s best. We, as consumers, can choose this agricultural model. 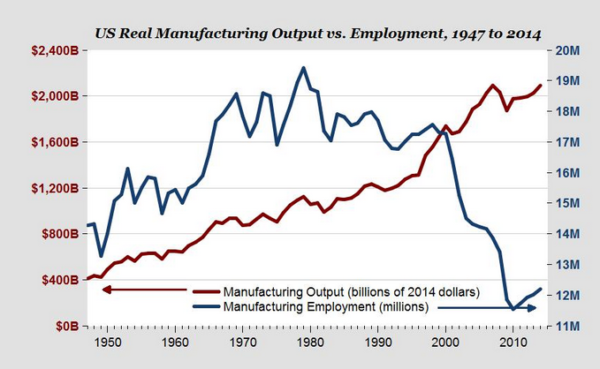 After the recession of 2008/2009, overall manufacturing output has increased while employment has decreased. 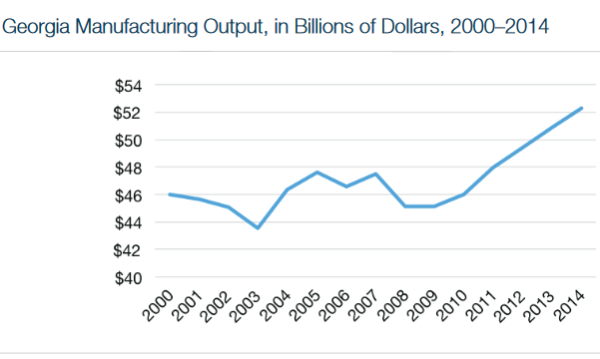 Production is steady and back to pre-2008 numbers. 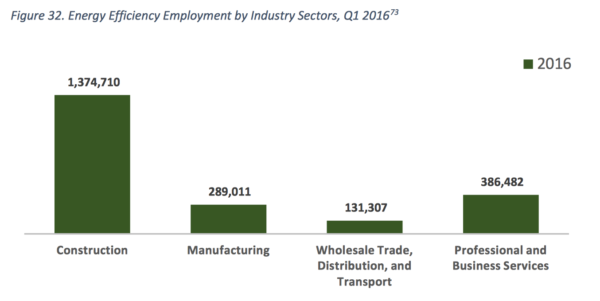 Employment numbers have been steady 2013-2016, with little overall net gain or loss. 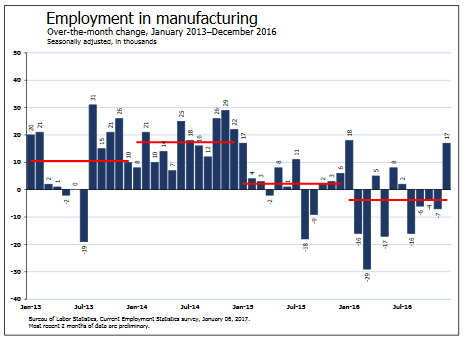 After our last recession, we have regained our production output, but not our manufacturing jobs. Most of the loss is due to companies adopting lean manufacturing philosophies and implementing automation technologies, both replacing factory workers. This trend will continue in large manufacturing facilities as demand for high volume and a low standard deviation of allowable error dictate the need for mechanized precision. Therefore, increasing American-made products (production levels) does not necessarily translate to an increase in jobs, at least not the numbers we are looking for. To create local jobs, we need utilize local resources. Applying the same logic as in agriculture, produce and consume as much as possible across all markets (Residential, Commerical, Industrial, Transportation) regionally. Consumers purchasing products made locally leads to increased regional demand, creating local jobs. Regions trading with each other to make up for deficiencies, keeping trade as close to home as possible. As we create and implement regional solutions to consumables, manufacture all components regionally. Create jobs and keep the economic benefits of the projects, from start to finish, local. Aside from stimulating the local economy, shifting to a regional mindset for product consumption reduces energy use and waste associated with a typical product cycle, most specifically in packaging and distribution. Less fuel consumed, saving on costs and reducing pollution. Reduced packaging, saving on cost and waste. The ultimate goal as regions should be to create sustainable product cycles where locally made products and packaging is 100% recyclable, eliminating waste and reliance on harvesting new materials. 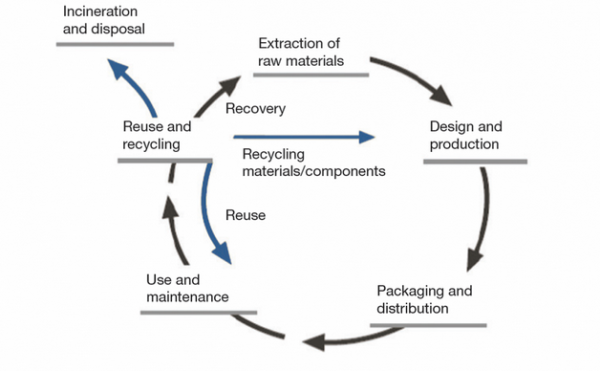 A net-zero product cycle. As far as the percentage of products we buy locally, I can’t find much on the topic. Whereas there is already momentum towards regionalized agriculture and supporting local businesses(I approve of both! ), there doesn’t seem to be much out there currently surrounding regional product solutions. Since I don’t have a baseline, I can’t know for sure what percentage of local products we are currently consuming, but I know we can double it (at least) in some regions. Identify local production capabilities and create directories for products made locally, searchable by product. Ultimately, the shift to buying local products is dependent on consumers. 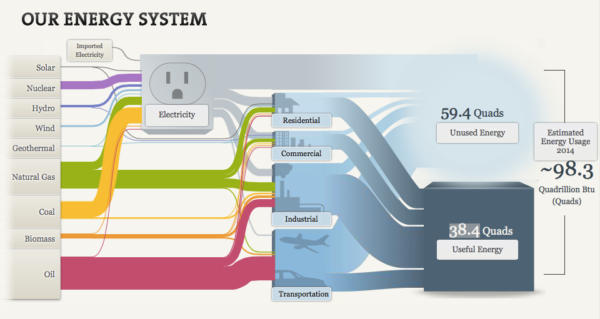 America produces 91% of the energy we consume. USA top producers of natural gas globally with consumption of 27,059 Billion Cubic Yards. Russia is second. 2015 highest production year to date for natural gas. In 2014, oil production reached it’s highest level in 100 years. USA second highest producers of coal globally with 1,000,049 Thousand Short Tons. China is the greatest global producer at 4,270,620 Thousand Short Tons. Coal production has shown a decrease in production 2008 – 2015. 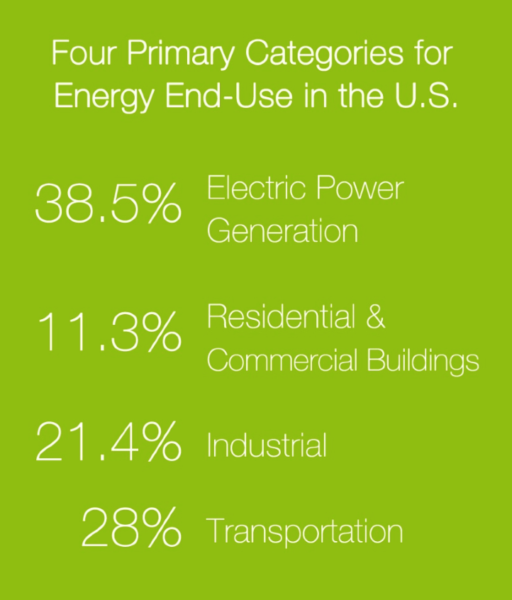 USA produced/consumed 9.7 quadrillion Btu across all renewable energy sectors. USA highest producer of nuclear power globally with nearly 800 Billion Kilowatt Hours. Second is France at about half that amount. Nationally, we operate at a 9% energy deficiency mostly filled via imported petroleum products (think Saudi Arabia, etc.). As a nation, we are seeing peak production in all energy sources aside from coal and we are still operating at a 9% deficiency. Our model will never lead to sustainability and has consumers reliant on resources expected to start running out in 25 years. 1) Economic benefits are realized by a small fraction of the population, going to select individuals, corporations, lobbyists, and brokers. 2) Current practices to harvest, transport, distribute, and consume fossil fuel are causing costly and often irreversible global impact. 4) Current models and estimates of reserves vs. consumption have us running out of fossil fuels globally as soon as 25 years from now. Regardless of your position on fossil fuels, we need energy solutions. I understand that so long as there is money to be made, fossil fuel will continue to be pushed for consumption, but, as noted above, this will benefit a select few, the potential for economic growth is minimal, and our rate of consumption is higher than our production capabilities. Fossil fuels will run out and they will not return (non-renewable), meaning renewables and nuclear are, ultimately, our only path forward. The more advanced our renewable technologies become, the better positioned we will be as a nation moving forward. Renewables offer the most potential for economic growth and development at a local level; jobs are to be found in renewables. Increasing our use of renewable energy across the four primary categories of end-use can fill the energy resource deficiency gap and lessen (or eliminate) our need for imports. Shifting to regional solutions for energy allows for local consumption to drive emerging markets with new jobs across multiple sectors. There are opportunities across all four primary categories of energy end-use to shift to renewable technologies to spark advancement, but for now let’s focus on Electric Power Generation to illustrate potential. 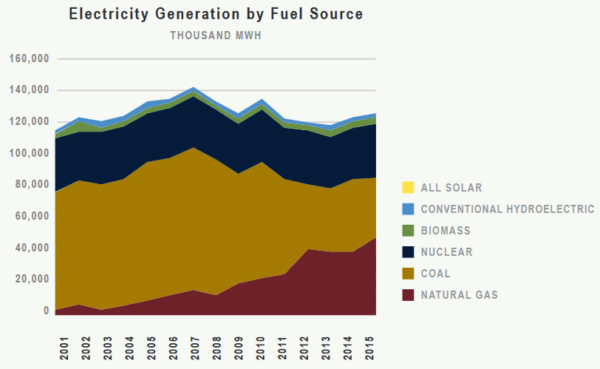 Fossil fuels, nuclear, and renewable sources generate electricity. Electricity is considered a secondary power source (whereas fossil fuels, renewables, and nuclear are all primary fuel source), meaning we will always need energy solutions to create electricity. 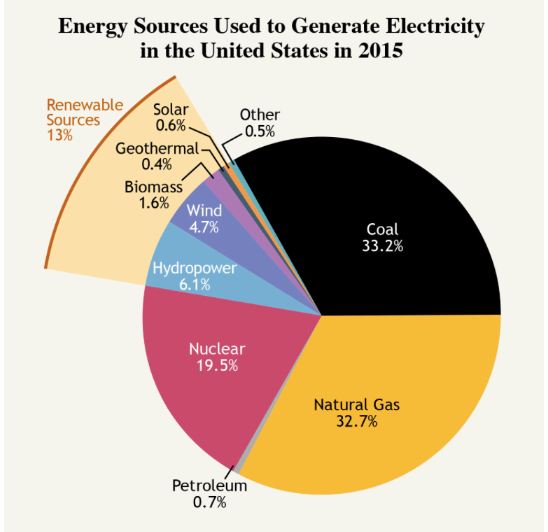 Fossil fuels natural gas (32.7%) and Coal (33.2) account for 2/3 of energy sources contributing to electricity production with nuclear (19.5%) taking up 2/3 of the remaining 1/3. Renewable sources account for 13%, solar .6%. 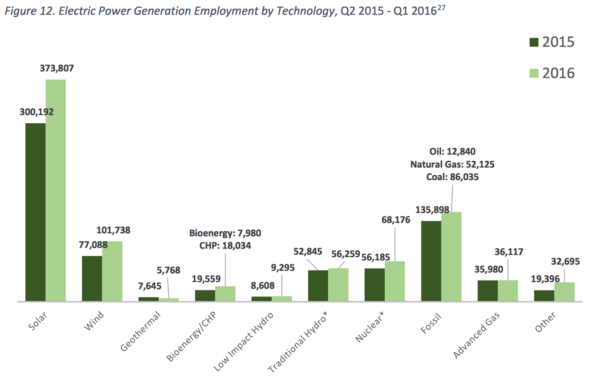 From the charts below, renewables account for the largest percentage of the Electronic Power Generation Employment, show the largest percentage growth from 2015 and 2016, and offer the most economic growth potential. 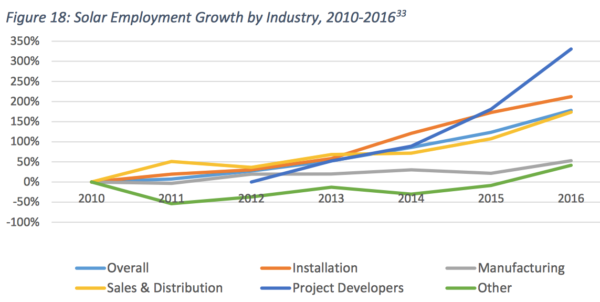 Focusing on solar in the chart above, 73,615 jobs were added from 2015 to 2016, a 25% increase, creating jobs across multiple market sectors. This is with solar only representing .6% of our electrical production nationally. As consumers, one of the best and easiest ways for us to directly influence our local economy is by purchasing energy efficient products and making energy efficient improvements to your household or business. Just looking at construction(my industry), the jobs potential is incredible. 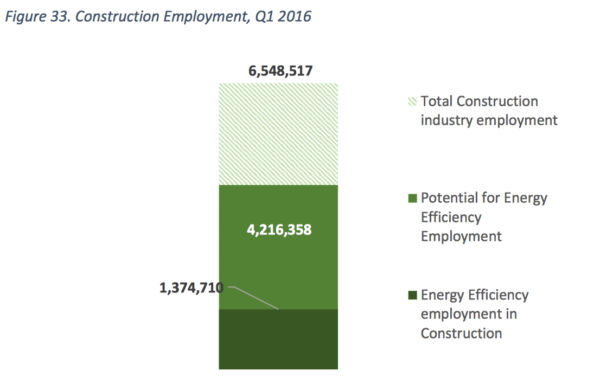 As more manufacturing jobs move towards automation, construction is one industry where physical labor is still required in numbers enough to create economic impact. 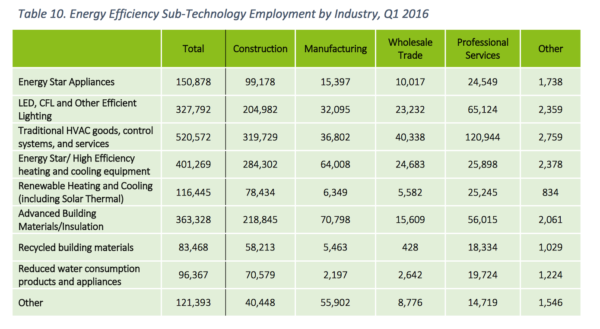 Breaking down jobs by sub-technology shows how, as consumers, choosing to implement energy efficient solutions directly impacts economic growth. Create and implement regional energy solution strategies optimizing renewable resources available (wind, solar, biomass, hydro, geothermal, etc.) to make up for regional energy deficiencies and as a tool to stimulate local economic growth and development. Achieve a net increase of 9% production of renewable energy nationally aimed at offseting energy deficiencies. Regions with net-zero consumption, producing all energy consumed. Manufacture all components of energy plans regionally. Create local jobs and stimulate economic growth. 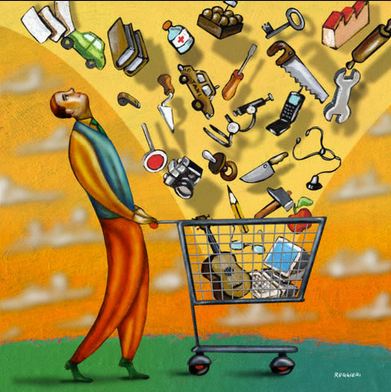 Demand and consumption become catalysts for growth. Lessen environmental impact and the costs associated with cleanup. As a nation, we are looking for job solutions and energy solutions, the pursuit of regional renewable energy solutions provides both. 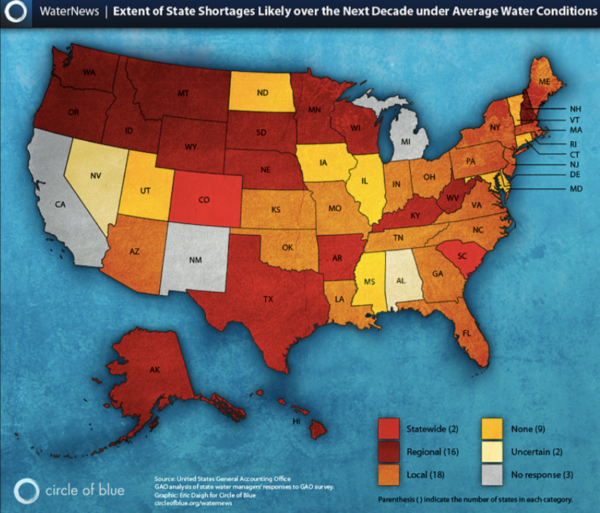 The top map shows water stress by country, the second is a scan by NASA showing underground reserves, and the third shows the likelihood of each state having water issues in the next decade. 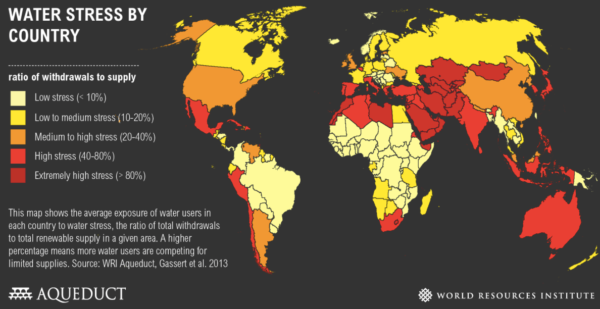 Water is quickly becoming a local and global issue. Water solutions offer a big opportunity. Regional water solutions are necessary and the market is just emerging. Working regionally to create sustainable water solutions will ensure regional stability moving forward. Regions with water solutions will be well positioned as water becomes more of a commodity on the global market. These two charts were taken from the the U.S. energy and Government Report, the same report I got the statistics on growth potential in energy. Hiring difficulties are overwhelmingly the result of “Insufficient qualifications, certifications, education” or “Lack of training, or technical skills”. I see this very often professionally, people do not have what it takes to compete in today’s shrinking job market. It isn’t expected to get better. As a whole, our educational practices are failing us. We have a growing sector of the population, regardless of education level (GED to advanced degrees), who are unskilled, incapable of cognitive thought, and unaware of how to enter, compete, and maintain employment in a dwindling and rapidly changing job market. As a nation, we aren’t providing our students with the skills needed for success. The educational system (K-12) and job market offer divergent methodologies and requirements. 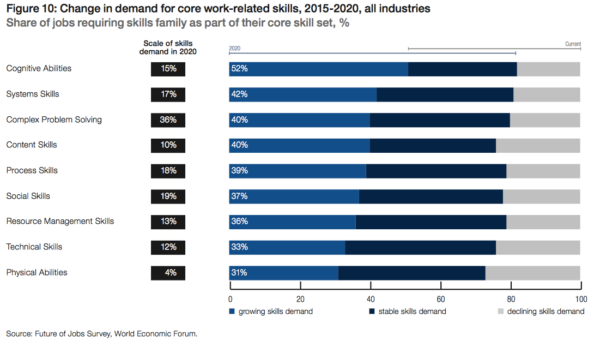 While our educational system focuses on standardized curriculums, memorization, and testing ability(recognition and recall), the job market focuses on skill sets, adaptability, and problem-solving (cognitive ability and learned behavior). As we shift to a regional mindset for consumables, investing in local resources to create jobs and stimulate growth, knowledge attained from local industry should be incorporated into education. Working with industry leaders, we need to educate with the intent to prepare students for the local job market well before they graduate. Higher education should be affordable and aligned with the local market, working to develop the skills necessary for success. Local business should take a vested interest in helping equip students with real world, local, workplace knowledge. As trends shift, so should our educational methodology. As a nation, we need to build an educated, adaptable, labor force with the cognitive ability required to thrive in the evolving marketplace. Our goal should be for every person to have skills necessary to become employed, regardless of their level of education. 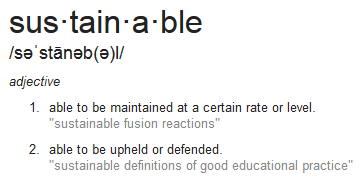 Only with an educated and skilled population can we achieve maintained stability as a nation. Using regional consumption, resources, and production capabilities as a catalyst, stimulate economic growth and create local, sustainable, markets. The first step to local jobs is to think locally, investing in our communities, and nurturing our businesses. This all starts with consumer choices and a shift to a regionalist mindset. Below I will apply the logic presented above to Atlanta (GA) in an effort to show economic potential through regional solutions to consumables. As a “region”, Atlanta has significant production capabilities and resources that can be optimized to create sustainable solutions leading to a healthier, more prosperous, community. 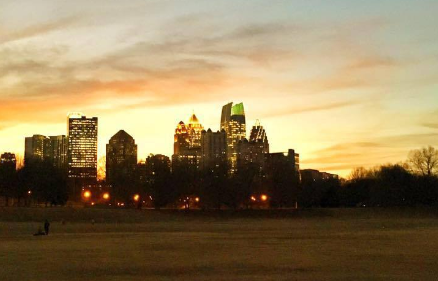 As a city, Atlanta is well positioned to become a global leader in sustainable solutions. 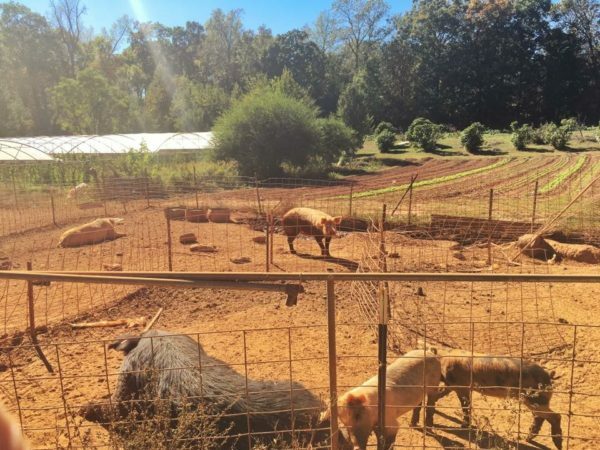 Atlanta has a thriving regional sustainable farming culture with vast growth potential. Our soils are fertile and there is a cornucopia of produce and livestock farmed and raised locally with minimal impact. The options to buy fresh, local, agriculture are there, as consumers we just need to seek it out. Additionally, there are efforts throughout the city to make these goods available to a larger population at prices that are competitive with industrial farms. 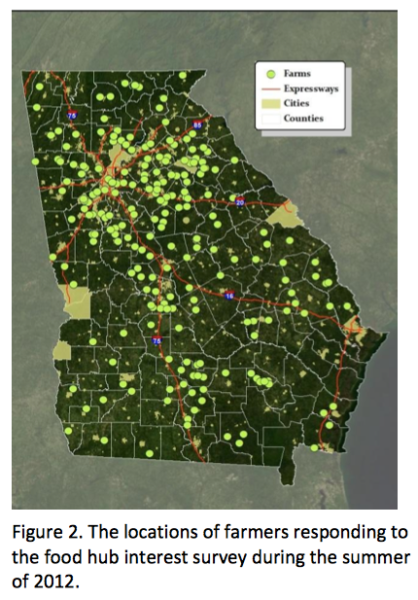 The most compelling information I found on getting local food more readily available in the local market comes from the Georgia Sustainable Agriculture Consortium and looks at the interest and feasibility of food hubs. One deterrent to purchasing local agriculture is convenience. Most farmers sell locally via farmers’ markets, limiting access to those who may not have the time or ability to get to a market. 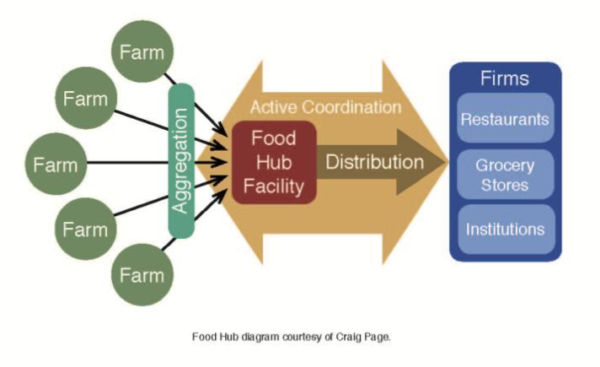 Food Hubs allow for the broader distribution of local agriculture into the community for passive consumption in restaurants, at gas stations, food marts, etc. This is just one avenue to explore that will help us optimize our regional agriculture market and stimulate our local economy, there are many more. I have no doubt Atlanta can meet the goal of 30% local agriculture consumption. MODA – Museum of Design Atlanta currently has on exhibit “Food by Design: Sustaining the Future”. The thoughtful and beautifully curated show displays solutions presented from around the world for creating “sustainable, environmentally-friendly, and efficient ways of producing healthy food”. 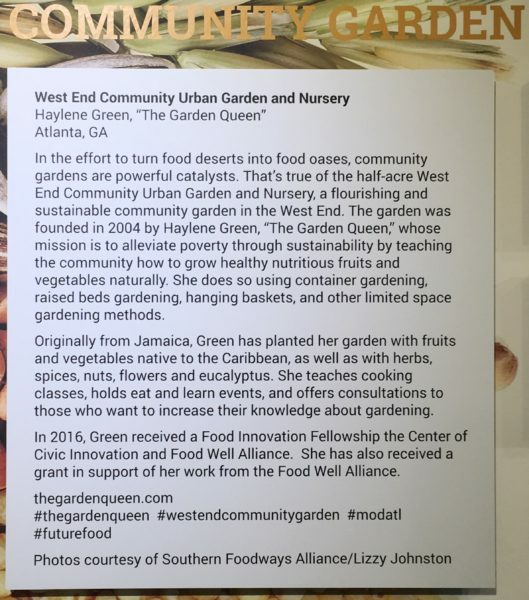 There were multiple programs from Atlanta represented, programs that can be expanded and resources we, as consumers, can support, including the West End Community Urban Garden and Nursery. I even got to meet “The Garden Queen”, Haley Green at the opening party. 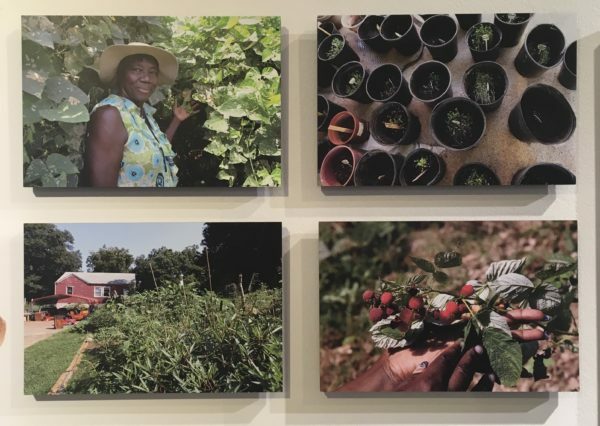 She is showing how food can bring communities together and also demonstrating the potential of the Atlanta soil by growing a tropical garden right in the city. Piedmont Park Green Market – March to December you can find me here every Saturday. The market offers a diverse group of regional farmers and merchants selling everything from tea and honey, to cheese and fresh meat. Not only is it a source of local, sustainable, healthy food for me each week, I also have grown to love all the vendors and the regional farming community we have. It makes me proud to eat food grown locally by people I know care about the food they produce and the benefits it is having on the community. 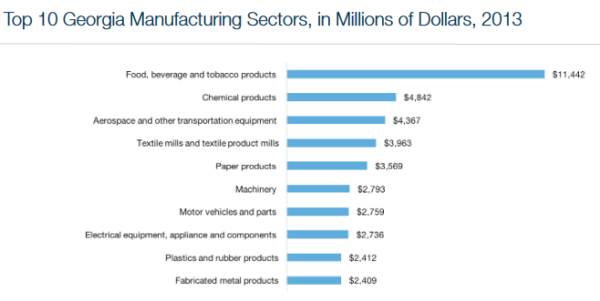 $35.6 Billion of $52.25 Billion manufactured in Georgia is exported (68%), mostly through free trade agreements and the TPP(Trans-Pacific Partnership). Georgia is positioned well on the global market and exports are essential to the local economy. 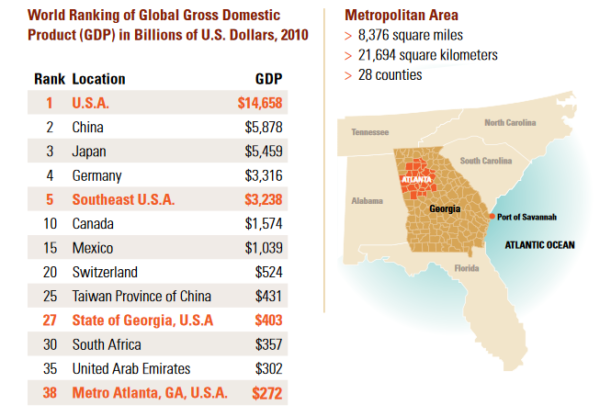 Georgia and Atlanta are examples of global partnerships being advantageous. Maintaining exports, let’s target the 32% percent of goods not being exported ($16.5B). Working regionally to produce and consume as much regionally as possible and keeping full product cycles local will allow maximum economic benefit from production through consumption already taking place. I currently can’t find a comprehensive directory of what is “Made in Atlanta” (or Georgia), by product. One needs to be created, it would help consumers who want to support their communities. New Industries and Opportunities: To create new local jobs, we need to assess potential markets and regional opportunities to capitalize on strengths. Consumable Solutions – Agriculture. Water. Energy. Startups – Work with Atlanta’s thriving start-up community to produce concepts and projects locally. Research and Development – Example: Georgia Tech Research Institute works with entities (governments, companies, etc.) from around the world go to seek solutions to real-world problems. Each project offers economic potential if realized locally. Atlanta and Georgia have immense production capability; working with existing resources to increase local consumption as well as target new industry will further our endeavors and add the types of jobs needed. 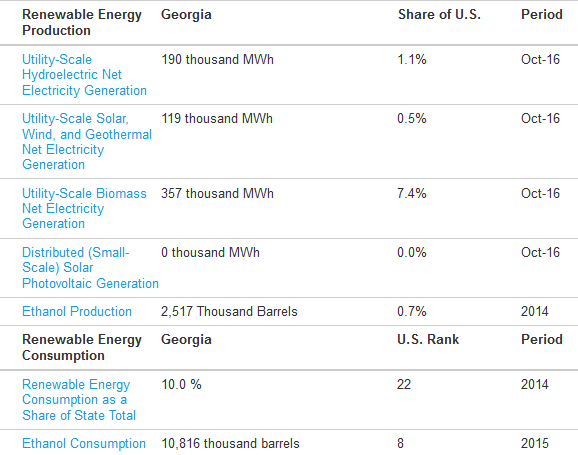 *Georgia’s Energy Profile offers a comprehensive breakdown of the energy consumed in Georgia and it’s source. Our state has zero (O) reserves or supplies of Oil, Natural Gas, or Coal. Renewable Energy Production accounts for 10% of total energy. Biomass (wood) is the highest renewable source at 7.4%. 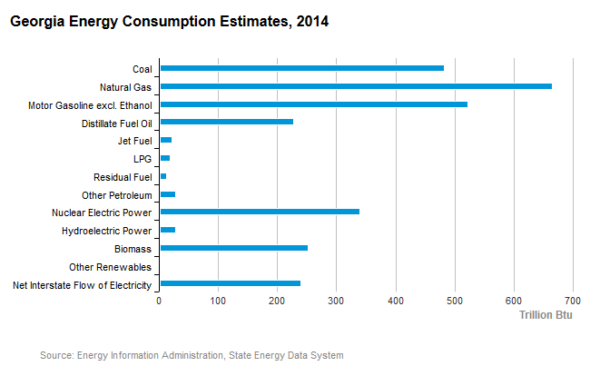 Georgia’s current energy model has the state reliant on outside sources of fuel for most of the state’s consumption requirements since Georgia as no supply or reserves of fossil fuels(and never will). This scenario puts Georgia in a very vulnerable position should there ever be a breakdown in the process of getting fuel to and through Georgia (mostly moved through pipelines and coming through the Port of Savannah). Also, this model translates into an economic benefit for very few. Nuclear is a viable option in Georgia, and there has recently been expansion in nuclear capacity, which I applaud, but, as noted above, our best options for economic development are in renewables. For Georgia, the pursuit of regional renewable energy sources offers a promising economic path forward and would better position the state as global resources become less available. GEFA’s 2016 Georgia Energy Report gives a breakdown of energy use in Georgia, looking at renewables, transportation, and energy savings programs. The charts above show electronic generation by fuel sources as well as capacity, both confirming reliance on fossil fuels and little use of renewables in electricity production. 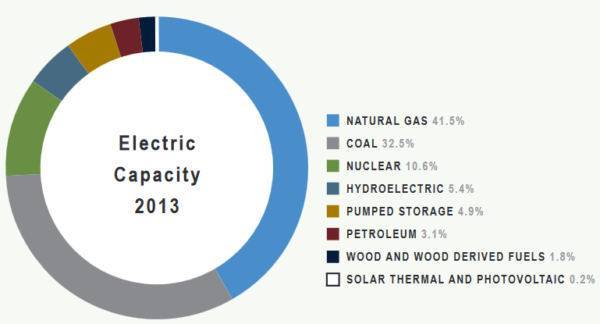 Fossil fuels account for over 3/4 of our electricity generation and capacity. Again, Georgia has no source of fossil fuels. Our reliance on others for fuel sources is a deficiency for the state and Georgia has immense potential for renewable solutions able to reduce the dependency on outside fuel sources while stimulating local economic growth. 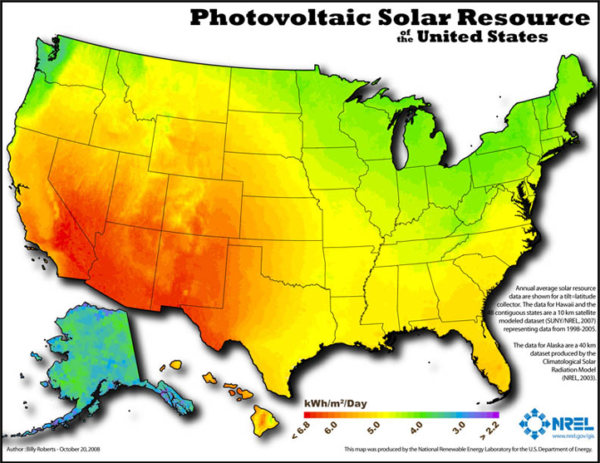 Aside from Biomass, Georgia also has potential in wind energy (coastal and mountain regions) and solar energy solutions, both of which have major growth potential. In Atlanta, solar energy offers real opportunity to turn consumption into a catalyst for growth. Georgia is well suited for solar and GEFA’s 2016 report confirms that, noting that by the end of 2016 Georgia will have installed over 1 GW (Gigawatt) and ranked 8th in new solar installation in 2015, up from 16th the previous year. 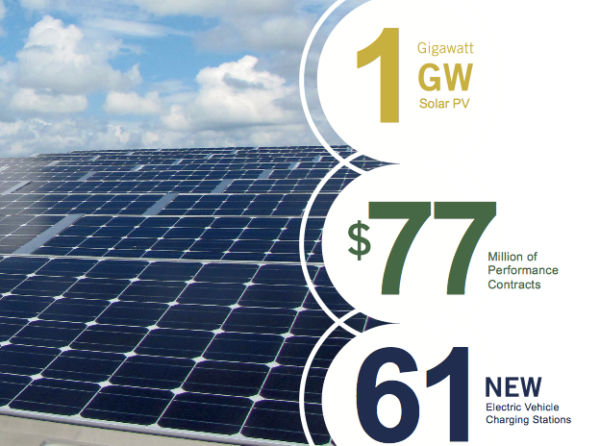 Many of this is due to legislation change, specifically HB 57, the solar power free-market financing act of 2015, which opened the state up to solar leasing and PPAS (power-purchase agreements), giving the green light for utilities such as Georgia Power to push forward with implementing solar plans. Additionally, the cost of solar has dropped over 50% since 2010. Below is a “what if” scenario showing the economic potential of implementing a plan to convert 30% of Atlanta’s residential electricity consumption to solar via 250W solar panels manufactured regionally. Since we have no fossil fuels and need to come up with sustainable solutions, let’s target 30% for residential solar growth in Atlanta. How many solar panels will that take? This takes a little bit of math, there is a good breakdown of it here, but I will go through it quickly, using a 250 Watt solar panel as a basis. Cost with installation from best I can tell is between $7-9 per Watt. Let’s assume each solar panel is 250 watts (which is about average). Assuming $1,600 is the average cost of electricity per household (chart above) and that the use of 30% solar would drop the cost of electricity 30%. *I believe this project can be funded by 30 year general obligation bond funds sold on the open market, the same type of bond scenario used to fund capital improvement projects by State of Georgia (my employer). An immediate boost to the local economy would be achieved through production and installation of solar solutions and benefits would continue throughout the lifecycle of the project via maintenance and upkeep as well as when demand requires further expansion. The impact would be across multiple sectors, specifically construction and manufacturing, the types of jobs needed. Transitioning to renewable sources of electricity would be a major investment in the energy infrastructure and stimulate the local economy across a broad spectrum of industries (see charts under Energy). The pursuit of renewable energy is the direction Atlanta has to go anyway, this is an opportunity to emerge as a leader in the global market. By seeking solar solutions for 30% of Atlanta’s residential electricity the city can use current energy consumption as a catalyst for investing $4.14B to be applied directly to Atlanta’s economy. If all or most of the project components are produced regionally and installed using regional resources and labor, Atlanta would achieve maximum benefit on the front and back end of the project. It would also put Atlanta in a more secure energy position moving forward. 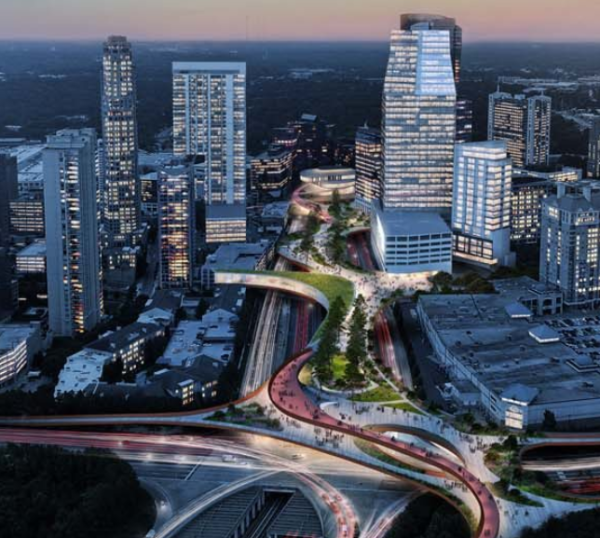 In Buckhead, Atlanta, there has been much excitement about building a “bridge park” spanning the section of interstate (GA400) stretching between two major roads, Peachtree and Lenox (see above rendering). I love the idea, especially having seen firsthand the success of the Klyde Warren Park in Dallas. There are similar ideas floating around about covering other parts of the connector in Midtown and Downtown, I applaud and encourage the development of them all. Imagine a series of bridge parks expanding over the connector as it flows through the city and where there are no parks, there are suspended solar fields with 2,069,320 solar panels, providing 30% of our residential power; a river of “green energy”, parks and solar, cutting through the city. Now, imagine all aspects of the project are produced locally using regional resources and employing regional workers. The benefits, economic and social, would be significant, creating jobs, generating sustainable energy, stimulating the local economy, and adding value to the brand of Atlanta. If this project were implemented over a 10 year period it would provide the type of jobs we need more of, solid paying labor-oriented positions with easily defined and trainable skills. Solar Power In Georgia – All You Need To Know! 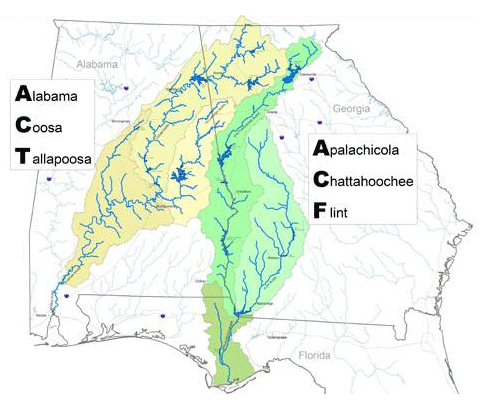 Tri-State Water Wars (see maps/chart above) – Georgia, Florida, and Alabama all share water sources and are currently in court battling water rights so access to fresh water quantities from contested sources are uncertain. 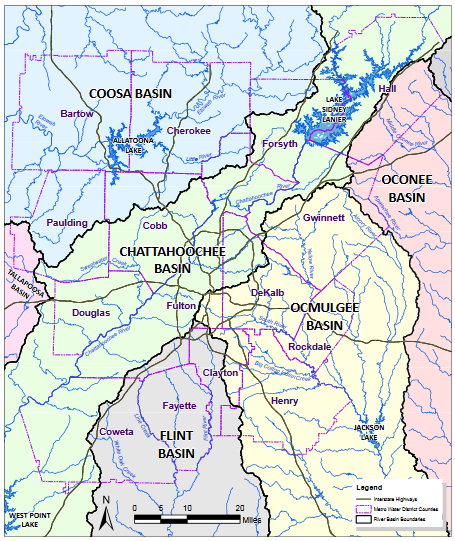 As with fossil fuels, Georgia (and Atlanta) is in a vulnerable position relating to water sourcing. 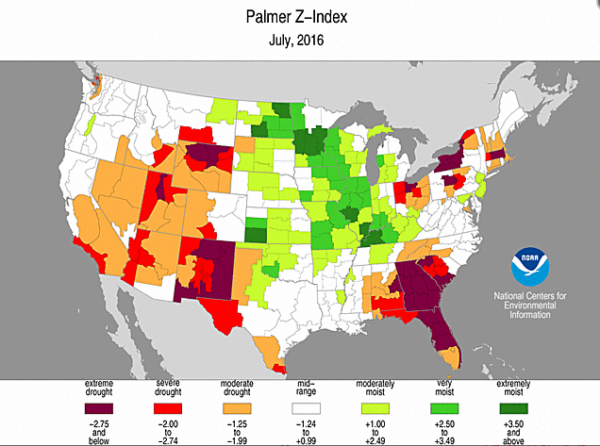 Droughts: The map below shows drought conditions in 2016. Note Georgia is shown with deep red, the worst on the scale, making Georgia even more susceptible to water shortages and crisis. 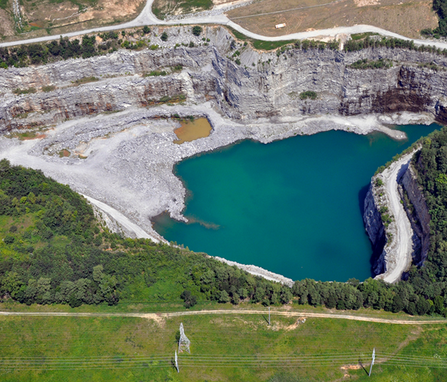 There are currently steps being taken to put Atlanta in a better position surrounding the availability of drinkable water, one of which is diverting water from the Chattahoochee River over a period of time into Bellwood Quarry (image below). Once completed, the old quarry will be an additional reservoir for Atlanta, joining Lake Lanier and Lake Allatoona, and will become Atlanta’s largest park. The project is a great example of using available, regional, resources to come up with solutions to consumables. I am very excited about the park! Beyond water storage, Atlanta’s best opportunity to reduce the need for fresh water aligns with finding sustainable solutions for water reuse. Less fresh water needed correlates with a diminished strain on reserves, putting the region in a better position for droughts, the legal system, etc. WaterHub is the type of solution Atlanta needs to capitalize on as a city. By implementing water solutions on a large scale, Atlanta would be well positioned as a global water solutions leader. How can Atlanta pay for this? MOST (Municipal Option Sales Tax) is a sales tax that has been passed every four years since 2004 for use on improvements to the sewer infrastructure, which is much needed in Atlanta. The WaterHub project and those like it should be implemented city-wide using MOST, with the ultimate goal being to create the most efficient and innovative system possible. It is time for the City of Atlanta to invest in water solutions, not band-aids. Water will become an issue sooner rather than later, implementing necessary steps now to secure Atlanta as a water sustainability and solutions leader and hub will allow for an improved position regionally and globally. There are many interesting stats on the site Statistical Atlas regarding demographics, incomes, and educational attainment of people residing in Atlanta. Of particular note is the relation of educational attainment vs. income. As related to Georgia as a whole, Atlanta has a higher percentage of residents with a “Higher Degree” (46.1% above average). 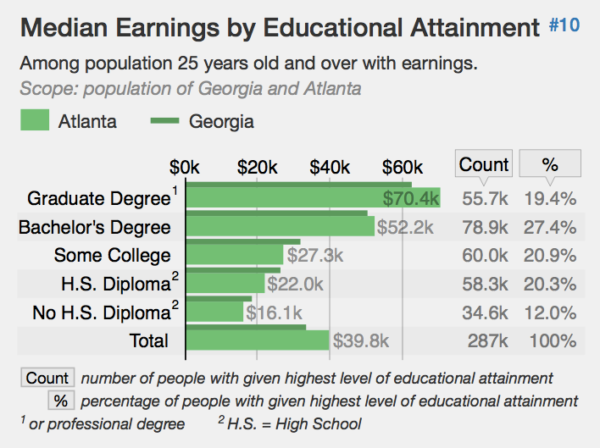 Attainment of a college degree in Atlanta corresponds to earnings higher than Georgia average, making $52.2K and above median income per year. Not attaining a college degree corresponds to a lower than Georgia average, making $27.3K and below median income per year and below. 152,900 out of 287,500 (53.2%) of Atlanta’s population over 25 has no college degree and makes, on average, less than $27.3K per year. The above charts show Living Wage in Atlanta. Note the “Required Annual Income Before Taxes” is $23,561. 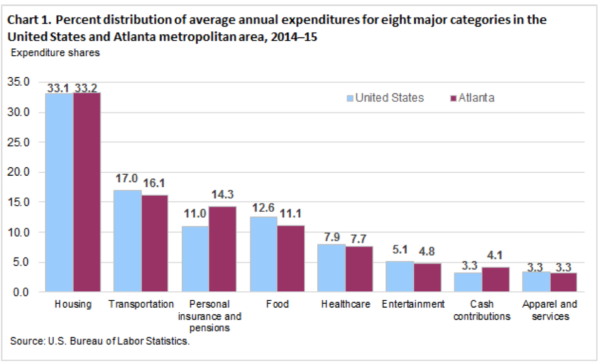 As related to Median Earnings and Educational Attainment, 53.2% of Atlanta’s population over 25 is living near or below an income deemed needed to live in the city. One can only assume the statistics for under 25 are equally concerning. This scenario is contributing to economic and social stress on an already strained system. It is in the best interest of Atlanta to create job opportunities for this population and give them the skills necessary to fill them. More money in the pocket of our families will create benefits across all sectors of the community. Finding ways to make this a reality should be a priority for the city and can be used as an opportunity; otherwise, our current model is a burden for all. 1) Increase regional agriculture consumption with local food distribution hubs. 2) Increase regional product consumption with local product distribution hubs. 3) Work with research institutes and startups to manufacture solutions locally becoming a solutions technology global leader. 4) Local production and installation of solar panels and fields as part of Sustainability Park. 5) Use MOST to make sustainable improvements to our sewers and water systems by implementing WaterHub throughout the city. Educational and economic development efforts should be aligned to develop a skilled local labor force tailored to the local market and the long-term development of Atlanta. Not everyone needs to go to college, but everyone should be able to earn a wage that allows them to live, it is integral to the success of the entire economic and social system and our nation as a whole. Technical College System of Georgia is a great model for an educational path focused on skill development for specific trades. Creating locally driven, trade specific, training for people prior to graduation from high school should allow students more available options and confidence to pursue higher wage positions regardless of educational goals. If communities can provide jobs, we can tailor what skills are developed locally, and vice versa. The more specialized per region the better, it gives each worker more value on the market and makes our market more valuable globally. An idea I have been pursuing for the past few years is Atlanta as a brand (@brandatl). For me, this has been more of a social experiment exploring how to present the city in a way that captures the positive vibe and charm Atlanta has to offer, thus “branding” the city. Through showing the brand of the city, the city becomes more alluring and “valuable” to the audience, drawing a connection. I have found people are eager to connect to Atlanta; they want to engage with a city they identify with and the brands that make it up. People like feeling connected to “home” and appreciate when their hometown is presented well. When I have been discussing the concept of regionalism, people bring up the cost of buying regionally vs. globally, wanting to know my thoughts on the price differences and how to get people onboard with the concept. My response is always “branding”. Adding value comes through developing regional brands based on optimization of available resources. Each region has different resources, so their brand will be different, valued according to the way it is cultivated. Example – Italy: Each region is known for the distinct agriculture, products, etc. of that region, with each region being a distinctly separate brand contributing to the broader Italian brand, unmistakable on the global market. The value of each region is tied to the brand it presents through utilization of available resources. Value comes through branding and costs are driven by demand. By creating a brand that is valuable both locally and globally, costs become competitive locally and products more valuable globally. Beyond branded goods, Atlanta has an opportunity to emerge as a “City of Solutions” as it seeks regional solutions to consumables. The pieces are there, Atlanta just needs to optimize and highlight available resources. Regional Agriculture: Atlanta is already considered a “foodie’ city, incorporate the local agriculture scene into that brand. Regional Products: “Atlanta Made” regional product directory. People connect to brands they identify with and they will invest time and money to support brands they feel reinforces their personal ideals and pursuits thus strengthening their personal connection to the brand and its value to them. It is a cyclical process. When people consciously and cohesively develop and strengthen the brand of the communities they live, it brings them together in ways that attachment to other brands may not. Not everyone can connect over a Mercedes, but most people can get behind and connect with their hometown and making it the best it can be. I know I do. Regional brand development, if done correctly, adds value, economic and social. To compete in today’s market; regions need a strong, cohesive brand strategy. The past three years, I was President of the Atlanta non-profit Joining Hearts, Inc., an all-volunteer 501(c)3 focusing on HIV/AIDS solutions. There is no cohesive path forward to end the HIV/AIDS crisis in Atlanta. Only through recognition of the system as it is and the formation of a cohesive path forward that utilizes and optimizes available resources to fully illuminate and understand the contributing factors will Atlanta be able to start making real progress towards ending the crisis. Atlanta will not achieve it’s HIV/AIDS-related goals continuing with the same conversations, methodology, and actions. It won’t happen, it can’t. As a response to the need for a different path forward, in 2016 Joining Hearts expanding the mission of the organization from solely raising funds for housing to include the care spectrum and a bigger focus on awareness, a decision driven by current need and gaps in the system. Additionally, the organization changed the way grants are funded and opened the process up to any beneficiary falling under the new scope to allow for a broader engagement of the entire spectrum of need. As a result of rethinking the organization’s approach and engaging a broader audience, 2016 was a great year for Joining Hearts and the brand is as strong as ever heading into their 30th fundraising year. As communities seeking to move forward together, we cannot continue to engage in the same political and social discourse, utilizing the same methodologies, and consuming as we have; it will not secure us the results we seek. Operating independently, separating resources, and pretending we are not interconnected doesn’t equate to a successful path forward. We must succeed together in order to survive, that is the only way it works. As individuals, we can’t keep doing the same thing over and over again expecting different result. That is insane. It’s all connected – our entire community must thrive for us each to thrive. We can’t operate in silos, economic or social. The goals we seek will not be achieved using current methodologies and practices, we must try a different approach. People want to be a part of the solution if you give them the opportunity. I believe these four lessons to be generally applicable, and I hope others do as well. In order to solve the problems we face as a nation, we must shift our focus to solutions we can all agree on, implemented locally, with communities coming together to make that happen. There is no better team building exercise than problem-solving, and we all need to realize we are on the same team. If any of us lose, we all lose. I like the saying “The only difference between doing something and not doing something is doing it”, I remind myself this almost daily as I face my fears, try new things, and push myself to be the best I can be. It isn’t always easy to do something new or think differently about something, but the openness to change is worth the risk and it is the only way to grow. It all comes down to this question we must each ask ourselves: Is the collective prosperity of my community and our nation important enough to me for me to change the way I engage and consume? My answer is yes. I want my community to be the best it can be, socially and economically, and I know the only way for that to happen is for me (and the community as a whole) to take action to make it happen. Begin lobbying and advocating for all the solutions outlined in this article. 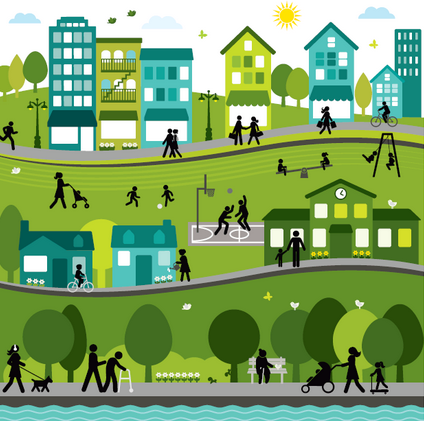 Become active in my neighborhood association and NPU (neighborhood planning unit). Re-engage my website brandatl.com to make it and the corresponding Facebook page and Instagram available as a tool for all of the above. Purchase and promote regional agriculture. Become involved with local food movement targeting ways to increase % of local food being consumed locally. Learn more about local production and what products make sense to purchase locally. Create a product directory of items made in Atlanta. Learn more about local startup community, available resources, and possibilities. Learn more about local research community, available resources, and possibilities. Share my thoughts and discuss this article with everyone I can in local government. Purchase energy-saving products and promote energy-saving practices. 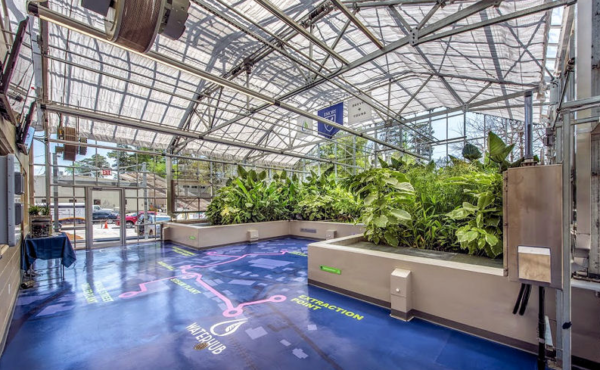 Tour Water Hub at Emory and learn more. Together we have an opportunity to create sustainable communities and a prosperous nation by working to find solutions that benefit the collective population economically and socially. As individuals, we can realize the nation we seek by rethinking the resources we have locally and changing our consumption practices and methodologies to align with regional realities and common goals. The choice to create a new path forward by working together as communities is our choice to make. Let’s take the steps necessary to make this a reality, we are the only ones who can.